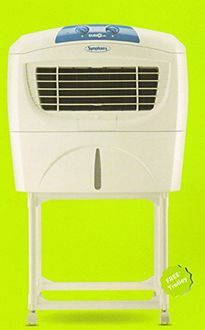 A room cooler is a great option to get relief from the scorching heat and dry summer. 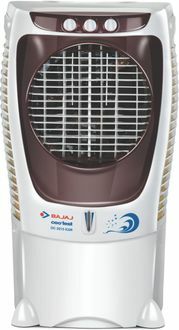 Bajaj, being a household name in the consumer electronics segment, can be a great choice if you are looking to buy a durable and efficient air cooler. Bajaj air coolers are equipped with features like multi-way air flow and castors wheels for easy mobility. Design-wise, they look stylish and complement the interior of your home. Below is the price list of 2 Bajaj 40L - 49L Room Coolers, updated on 21st April 2019. The power consumption of these products is around 200W, which makes them energy efficient in comparison to the traditional steel-body coolers. 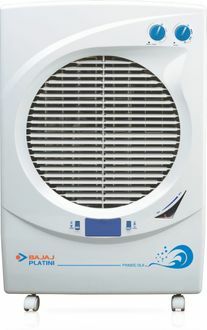 Other features include Continuous Water Supply, Front water inlet and air throw capacity of up to 80 ft.
Bajaj offers air coolers, which are made of a corrosion-free thermoplastic material that helps to increase the longevity. 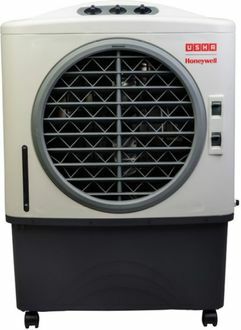 These coolers can efficiently cover a large room or medium size halls of up to 700 sq. ft. Bajaj coolers are available to buy online at favourite online retailers like Amazon, Croma, Shopclues etc. Click on the product you find suitable to get more details of the specification, reviews and frequently asked questions. You can also compare the prices offered by multiple online shopping portals and choose to buy from the one offering the best deal.